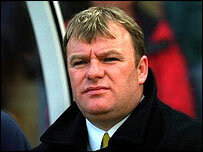 Steve Evans will be reappointed as Boston United manager on 2 March, it has been confirmed. He will take the job after completing a 20-month ban for financial irregularities following the Pilgrims' promotion to the League in 2002. Evans said: "I am delighted with the appointment and I'm looking forward to the big challenge ahead. "This season I want us to stay in the Football League and next season, I want to be looking for promotion." Boston chairman Jon Sotnick has put Evans on a rolling contract. He has insisted that Evans' salary will be halved for the first year of employment as punishment for the fine the Pilgrims received in 2002. Evans has told the BBC he will return to York Street a different man.